The Optek Criterion MAX is the third generation of Optek's landmark Criterion Digital Surfacing Cell, the world's first microprocessor-controlled finer/polisher. 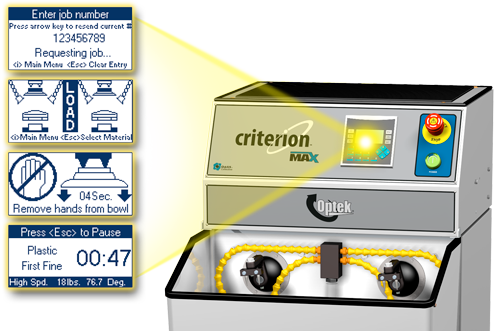 Based on the industry-leading mechanical design of the Optek 429, Criterion MAX extends this technology by using state-of-the-art PLC control to simplify operation, reduce operator decision-making, and increase quality. When interfaced to Rx calculation software, the operator simply enters a job number, and Criterion MAX automatically optimizes spindle speed, pin pressure, and cycle time. Enclosure is constructed of heavy duty gauge sheet metal — no injection molded plastic. Timed gear belt drive mechanism minimizes vibration and prevents motion irregularities during processing. Extended life bearings feature a special reservoir for adding additional lubricant. Double baffle system with tertiary internal drip shield protects internal components. Ergonomic design features a oversized chemical resistant slurry bowl. 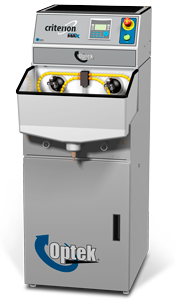 Slurry system accommodates either standalone or central slurry solenoid with hookups at the rear of the unit. Standalone system stores slurry in reservoir separate from pump to avoid overheating the slurry. Orbit and sweep range adjustments are made internally to prevent accidental resetting. Wide range of sphere and cylinder curves support both plus and minus surface processing. Slurry temperature monitoring system warns the operator if the slurry temperature falls outside the optimal range for the lens material being processed. Vacuum lens loading system speeds operation and reduces breakage from block and pin misalignment. Slurry pre-flood system speeds and simplifies operation by automatically flooding pads with slurry prior to cycle start. Multi-material processing feature automatically establishes optimal cycle parameters using the onboard material database (manual mode) or via download from Rx processing software. Auto speed ramping feature ramps spindle motors up to operating speed. This reduces pad separation from lap during start up, especially with helpful gripper type pads. Automatic mode — Serial interface allows job data to be downloaded from Rx processing software by job or tray number. Manual mode — Stores parameters for four materials in the onboard database. Maintenance advisor records running hours and prompts the operator when scheduled maintenance should be performed. Large LCD display provides easy viewing. Sealed membrane keypad protects electronics from moisture.